HK. 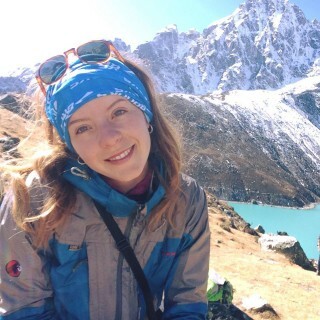 Teams Summit Gokyo- Ri with Halesi Treks guide Tek. 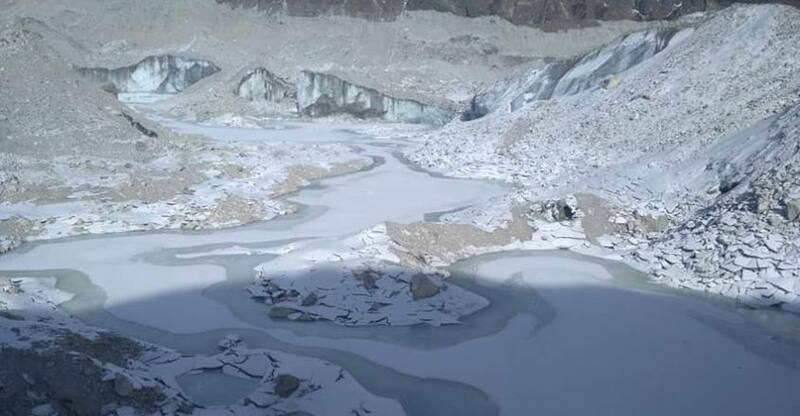 Ngozumpa glacier in Khumbu during the winter season. 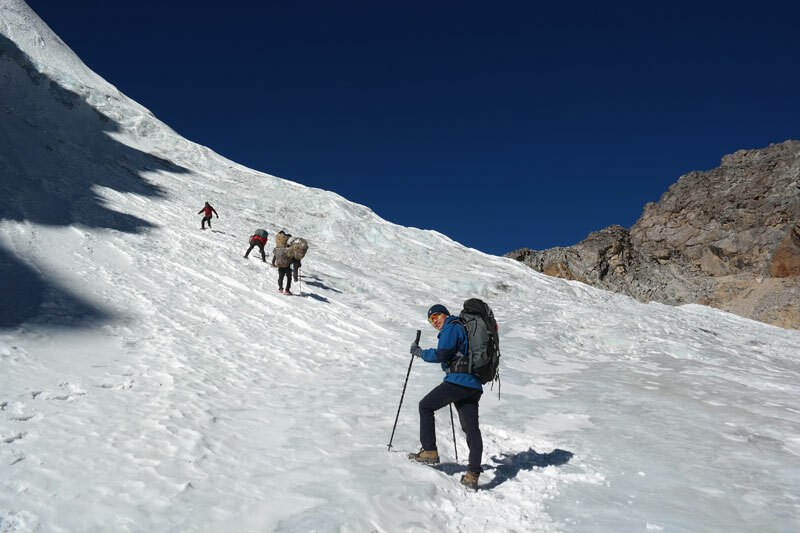 Three Pass Trekking in Khumbu is one of those unusually challenging and famous trekking trails in Khumbu Everest region with some of the most stunning landscapes found in this particular area. 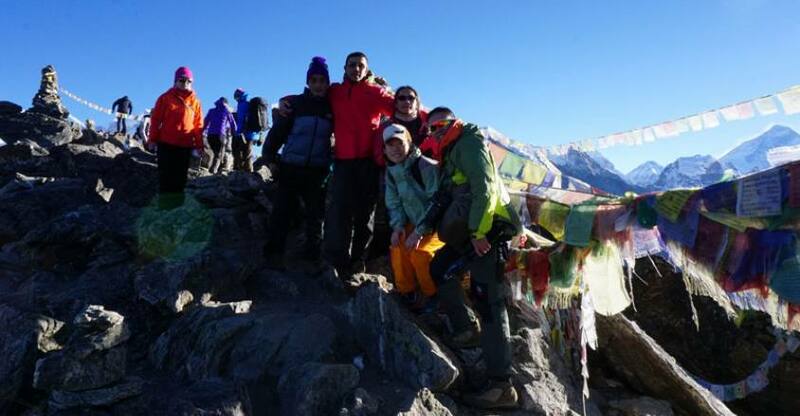 Three Passes Trek includes crossing of the Kongma La pass (5535m) Cho La pass (5330m) and Renjo La pass(5445m) This is arguably the ultimate high-altitude trek, available in the world’s most fabulous Himalayan region found geographically anywhere else. The terrain is tough hereabouts- but the blunt display of gasping scenery provides more than the normal rewards. 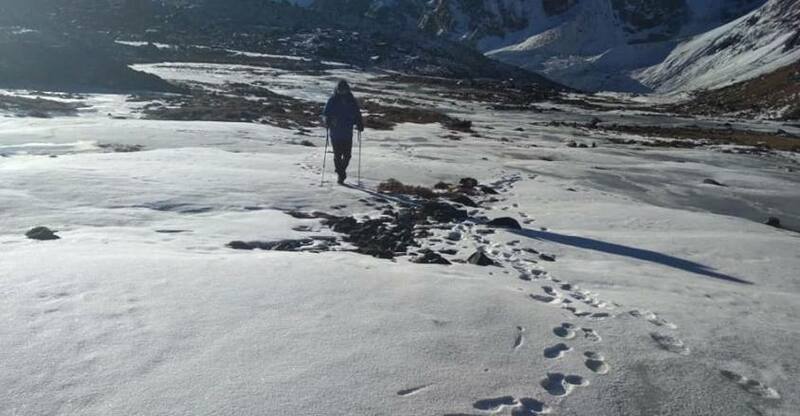 This trekking is combined with the ascents of Kalapatthar (5545m) and Gokyo RI (5357m.) it is perhaps the ultimate Everest experience in Khumbu Himalaya range. For the daring backpacker; this is not just a trek but can be assumed to be one of the finest mountain odysseys you are ever likely to undertake in your lifetime. 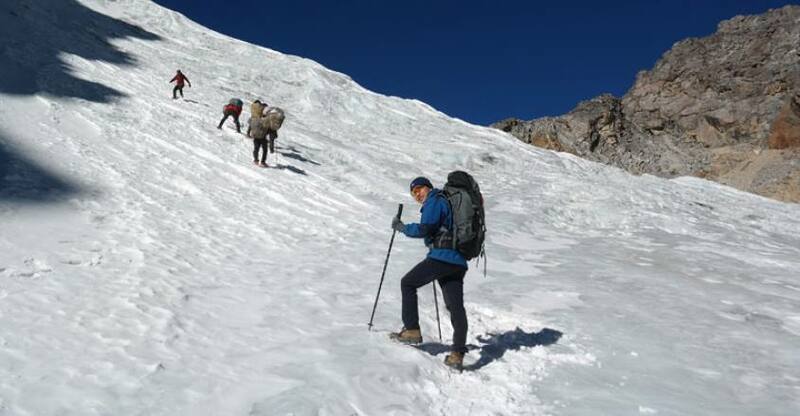 Three Passes Trek is one of adventure trek in the Everest (Khumbu) region of Nepal. You should have physical fitness and experience to do this trek. You will have a view of four world highest peaks: Cho Oyu (8201m), Makalu (8463m), Lhotse (8516 m), Everest (8848m) and other mountains. Pass through Everest Base Camp, Kalapathar, Gokyo Lakes, and Gokyo Ri in one single trek. Experience the quieter and less touristy side of the Everest Region. Day 02: Kathmandu to Lukla (2860m) Flight and trek to Phakding (2610m) – 4 Hours. Day 03: Phakding to Namche Bazaar (3440m) – 5 Hours. Day 05: Namche to Tengboche (3840m) – 6 Hours. Day 06: Tengboche to Dingboche (4360m) – 6 Hours. Day 07: Dingboche to Chukung (4750m) – 4 Hours. Day 08: Rest Day at Chukung. 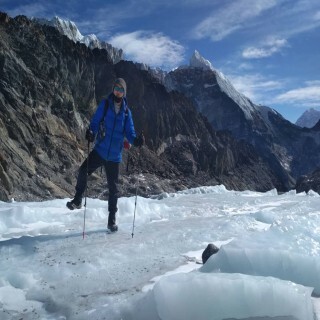 Day 09: Chukung to Kongma La (5535m) and then to Lobuche (4940m) – 7 Hours. 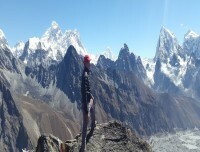 Day 10: Lobuche to Gorakshep (5181m) to EBC (5364m) and back to Gorakshep – 9 Hours. Day 11: Gorakshep to Kalapatthar (5555m) to Lobuche – 9 Hours. Day 12: Lobuche to Dzongla (4830m) – 4 Hours. Day 13: Dzongla to Cho-la (5368m) to Thangnag (4680m) to Gokyo (4800m) – 8 Hours. 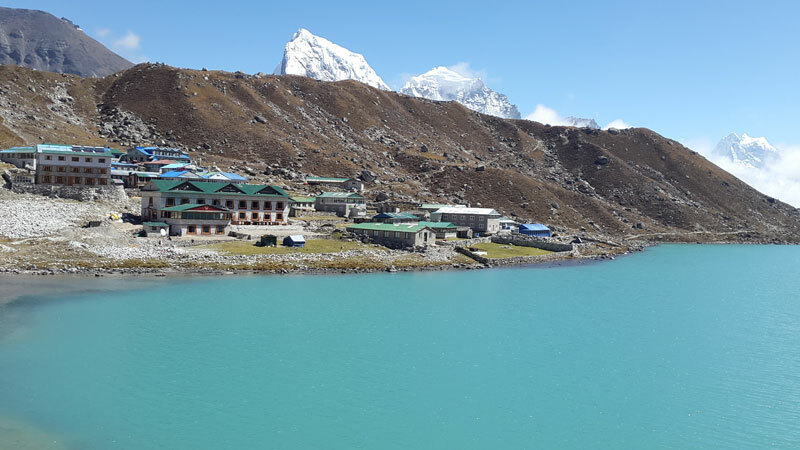 Day 14: Exploration Day in Gokyo and hike to Gokyo Ri (5357m) – 4 Hours. Day 15: Gokyo to Renjo La (5360m) to Marlung (4210m) – 8 Hours. Day 16: Marlung to Namche. 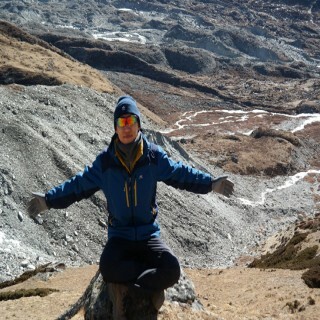 Day 17: Trek from Namche to Lukla. In case of emergency rescue helicopter if needed. We will manage. The representatives from Halesi Treks Pvt.Ltd will welcome you at Tribhuvan International Airport upon your arrival.then transfer you to the hotel and briefing about your trips. Overnight at Hotel. We get transferred to the domestic terminal of Kathmandu Domestic Airport this morning to catch our scheduled morning flight to Lukla. After 30 minute long adventurous flight above the breathtaking scenario of Himalayas, we land on the Tenzing-Hillary Airport at Lukla. Lukla is going to be the starting point of our trek. We meet our porters and other crew members and start trekking towards Phadking, which takes around three hours. overnight at guesthouse. We walk through the beautiful forest of pine today. And our walk leads us along the Dudhkoshi River bank through many suspension bridges. We will be crossing Hillary Suspension bridge which is one of the famous suspension bridges in that region. We will have enough opportunity to witness the wonderful views of Mount Thamserku (6618m) during the walk. Passing through the settlements of Benkar and Monjo, we eventually arrive at the entrance to the Sagarmatha National Park. We still have a last village of Jorsale before reaching Namche. Following the trail ascending through the forests and bridges and overlooking the beautiful views of Mount Everest, Lhotse, and Nuptse, we continue our journey towards Namche Bazer. Namche is the gateway to Mount Everest and is also the main trading center of the region. Overnight at guesthouse. Today is going to be a rest day at Namche Bazaar. But, as our Health Experts suggest, we need to stay active and moving during the rest days instead of being idle. Hence. You can visit the Tourist Visitor Center near the Headquarter of Sagarmatha National Park where you can observe an assortment of things which are related to the First Everest Climbers and Sherpa Culture.overnight at the guesthouse. 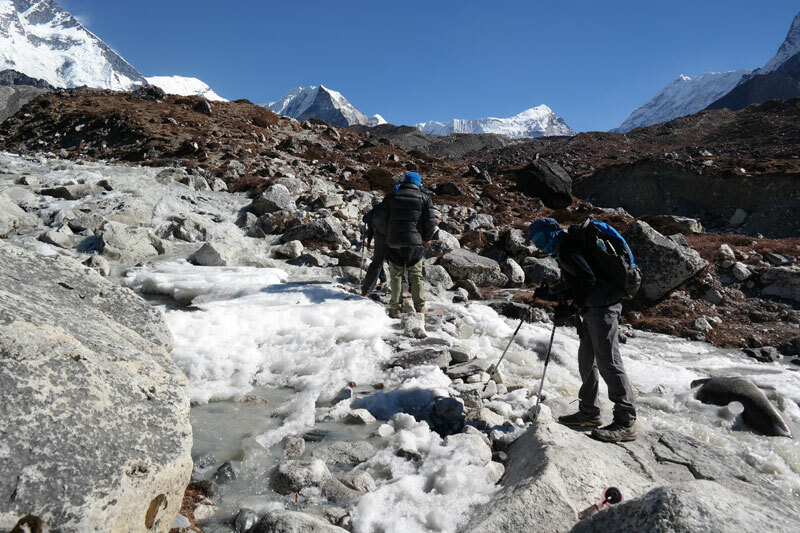 We continue trekking along the rushing glacial waters of Dudh Koshi, which eventually brings us to Tengboche. You can visit the local monastery and can also get the opportunity to observe the prayer ceremony either in the morning or evening.overnight at the guesthouse. From Tengboche, we drop to Debuche and then cross another exciting suspension bridge on Imja Khola. We then climb to Pangboche among thousands of Mani stones. Trekking further for about a couple of hours, we reach Dingboche. Overnight at guesthouse. We make a short hike to Chhukung through Imja Khola valley to remain active today. From Imja Khola, you can witness the splendid views of surrounding mountains especially Lhotse. overnight at guesthouse. As per the recommendation of trekking experts, we must acclimatize at Chukung as we are going to cross Kongma La pass. The view from Chukung and further up the valley on the moraines towards Island Peak is tremendous. We also get the opportunity to climb the Chukung Ri or climb the Island Base Camp.overnight at the guesthouse. From Chukung, we move on carrying plenty of water and some snacks and packed lunch as there are no teashops available on the route. For sure, you will enjoy the remoteness of the area and beautiful nature. The panoramic views of Amphu Lapcha, Kongma La, Island Peak Valley, overnight at guesthouse. Today is going to be another big and difficult day trek along the Khumbu Glacier and up to the Everest Base Camp. You can get the closest view of Mount Everest from Khumbu Glacier and EBC. After spending little time at EBC.Overnight at guesthouse. Actually, this day is going to be one of the most difficult yet rewarding treks. We make an early start to reach the best viewpoint of Kalapatthar. You can get the amazing mountain panorama from this viewpoint. After enjoying the amazing views from Kalapatthar, we return back to Lobuche.overnight at the guesthouse. Today is going to be very short trek relatively. From some distance from Lobuche, our trail to Dzongla branches off. We can enjoy the magnificent views of Thamserku, Ama Dablam, and Kangtenga on the way ahead. We eventually reach Dzongla. overnight at guesthouse. The mesmerizing views of Cholaste will make you feel so refreshed in the morning. After the breakfast, our trek traverses through a spur extending westward from Dzongla. Crossing the challenging uphill climb through snow and ice, we cross Cho La pass and then trek continually downhill until we reach Thagnak. overnight at guesthouse. Today, we hike up to Gokyo Ri for our ultimate goal to see the wonderful views of the Himalayas including Mount Everest. If the weather is fine, you can spend few hours at the top of Gokyo Ri. then descend back to Gokyo.overnight at the guesthouse. Today, we need to start down as we have to trace our trail up to Marlung after crossing Renjo La Pass. Leaving the main trail, we turn to Renjo La trail by Dudh Pokhari. We descend down to Marlung after crossing the Renjo La. overnight at guesthouse. From Marlung, we descend down to Thame following a traditional route used for centuries by Tibetan traders. After crossing the Bhote Koshi River, we descend to Tarang. Then pass through the valley of Lamjung Khola and we eventually reach Namche. Overnight at guesthouse. From Namche, we return back to Lukla. With this, we mark the end of our trekking. Overnight at guesthouse. We get the scheduled morning flight to Kathmandu from Lukla. The flight is going to be very scenic and adventurous. On arriving Kathmandu, you can take your time to go for your last minute shopping or you can choose to explore the city even more. Overnight at guesthouse. Today, you take the returning flight to your hometown. Our representatives will assist you to reach the airport. Kathmandu - Lukla - Kathmandu flight may be delayed by few hours or even canceled due to bad weather condition. So, you should be prepared for such flight delays or cancellations. But we will do our best to avoid such conditions. In case of flight cancellation, we will try to get you on the flight for the next day. Getting early flight for the next day may not be possible during the high season so, we can arrange flight by helicopter as well but it will be an extra cost. If we have a group of 4- 5 people, we can charter a helicopter from Kathmandu – Lukla. It will be advisable to have extra days in Kathmandu before and after the trekking. We can arrange you cultural / adventure tours (such as sightseeing tours, rafting, jungle safari, with extra cost if the extra days are not used for the flight conditions to Lukla and back. If the flight is delayed and canceled for several days which could disturb your onward journey, you are free to choose trekking in Annapurna, Langtang and other regions and we are Halesi Treks arrange the alternative trek. 환상적인 가이드와 쿰부 히말라야 3 패스! 2019년 1월, 추운 겨울이었지만 나의 가이드의 탁월한 리드로 안전하게 쿰부 히말라야 3패스를 성공할수 있었습니다. 할레시 트렉은 성공적인 트레킹을 위해 항상 고객 입장에서 생각했으며 숙소와 일정 그리고 음식까지 신경썼습니다. 무엇보다 좋았던 건 가이드는 멋진 사진을 찍어주기 위해 시간을 아끼지 않았다는 것입니다. I have to congratulate myself with Halesi Treks that organized an amazing and adventurous treks for our group. They planned everything on detail to make our stay in Nepal an unforgettable experience! The guides of Halesi Treks were very prepared and informed, kind and always ready to give their help, making us feel safe in any moment. I would strongly raccomand Man Kumar's Agency, even because their prices are cheaper than any other agency we contacted all in all, I could't hope for anything better, thank you! Ringrazio gli amici di Bergamo che mi hanno suggerito Man Kumar quale referente e Lorella che mi ha accolto nel suo gruppo per il mio primo viaggio in Nepal. È stata un'esperienza unica , tosta e indimenticabile, la prima parte sulle vette del Kumbu nel tour dei 3 passi , per 17 giorni con Niru, Take e gli sherpa , la seconda parte da Lukla a Paplu, nei villaggi incontaminati , accolti con grande calore dalla grande famiglia di Man Kumar , siamo stati accuditi e anche viziati con cilazione pranzetti , merende e cene sapientemente preparate dal cuoco al nostro seguito. Ringrazio calorosamente Man Kumar Tamal , la sua agenzia Halesi treks e tutto il suo team per la.grande attenzione e la super organizzazione prestata. Consigliatissimo a tutti gli amici e a chi vuole scoprire un autentico Nepal ancora incontaminato. 제가 아마 두 번째 한국인 고객으로 여기 에이전시를 다녀갔을 것입니다. 제가 다녀온 루트는 일반인들에겐 쉽지 않은 3패스 3리 코스였습니다. 추가적으로 EBC도 다녀왔고요. 에이전시 대표인 만쿠마씨와 그의 가족들은 정말 친절합니다. 제가 트레킹 전후로 숙소를 구하지 않았는데 자신의 큰 방을 흔쾌히 내어주고 부엌에 딸린 방에서 3가족이 잠을 이뤘습니다. 너무나도 감동이었습니다. 그리고 가장 중요했던 트레킹 가이드는 만쿠마씨만큼 아주 좋은 사람이었습니다. 저의 가이드는 텍이라는 이름을 가진 네팔리였는데 아주 순수하고 저의 의견을 존중해주는 사람이었습니다. 텍 덕분에 15일의 일정을 13일만에 끝냈습니다. 할레시 트렉이 비록 영어로 소통해야 한다는 점이 힘들 수 있지만 한국인들이 많이 이용했으면 좋겠네요. 영어로 소통하는 것에 조금의 불편함만 가지신다면 도전하셔도 좋을 것 같습니다. 다만 응급 상황엔 위험하니 영어가 부족하다면 안나푸르나 쪽 트레킹으로 가는 게 좋을 것 같아요. 에베레스트는 다녀와보니 심하게 가파른 곳이 많아 위험했습니다. 그럼 좋은 트레킹 되세요~ 정말 인생에 있어 한 번쯤 다녀 오시면 좋습니다. The below-given cost is per person and the below-given(Three Pass Trekking In Khumbu) fixed departure dates are available for you. If the given date is not favorable then please contact us and we will happily customize your trip on dates more appropriate for you.